1960,the industry is now one of the most lucrative movie industry in Africa. The good aspect of Nigerian music is that Afro pop is now widely accepted by different countries that knew nothing about the unique sound some years back. Females in the Nigerian music industry are not left out,in one way or the other they have also contributed to the success of the Nigerian music industry. You might be hallucinating if you think that the Nigerian music industry is not lucrative,as a matter of fact top ranking musicians in Nigeria have a net worth that is calculated in millions of dollars that's why we are going to check out some of the top 10 richest female musician in Nigeria and their estimated net worth. 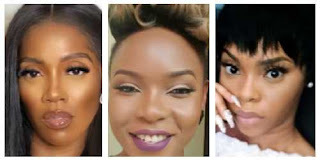 These top earning Nigerian female musicians smile to the bank regularly,without wasting much time,lets quickly countdown and see which Nigerian female musician made our list this year. Tiwa Savage has paid her dues and deserves to be among the the richest female musician in Nigeria. She announced her presence in the Nigerian music industry in 2010 with the hit single titled ''Kele-Kele Love''. Tiwa Savage whose real name is Tiwatope Savage-Balogun is a Nigerian singer,songwriter, performer and actress. She signed a lucrative song writing deal with international label Sony/ATV. The music diva who was born in 1980 is estimated to be worth 5 million dollars. Tiwa currently has a record label deal with one of the biggest record label in Nigeria and Africa called Mavin Records. How many of you guys remember dancing to Yemi Alade's hit track titled "Johnny"? Yemi won the Peak Talent Show in 2009. She is a singer and songwriter whose birth name is Yemi Eberechi Alade,the beautiful Afro pop diva was born in 3 March 1989 in Abia State. Currently she is estimated to have a net worth of $4.2 million dollars. Chidinma whose birth name is Chidinma Ekile is a popular Nigerian singer and songwriter.The petite beautiful musician rose to fame after she won the third season of Project Fame West Africa in 2010. Chidinma was born in 1991,she is currently one of the richest female musician in Nigeria,she is currently estimated to have a net worth of $3 million dollars. Asa is a Nigerian-French singer that is popular in Nigeria. She was born on September 17, 1982. The french based singer and songwriter whose birth name is Bukola Elemide is a bankable Nigerian female musician with an estimated net worth of up to 2 million dollars. She is definitely one of the top 10 richest female musicians in Nigeria. Aituaje Aina Vivian Ebele Iruobe popularly known as WAJE, is a female Nigerian musician. She has featured in a couple of hit tracks such as P-Square’s "Omoge Mi" Banky W's "Thief My Kele" M.I's "One Naira" etc. She was born in 1980 and currently ranked among the richest female musicians in Nigeria with an estimated net worth of $1.5 million dollars. Coming in at number 6 is the beautiful Nneka who is a Nigerian female singer songwriter and actress. This talented musician plays different musical instruments effortlessly and sings in English,Igbo and Nigerian Pidgin. Nneka whose birth name is Nneka Egbuna was born in 1980,she is holding down the sixth spot with an estimated net worth of $1.5 million dollars. Seyi is a Nigerian singer and songwriter,Shey Shay's birth name is Deborah Oluwaseyi Joshua,in 2015 she released her debut studio album titled Seyi or Shay,the talented musician has written three songs for the soundtrack to Konami's video game,with a current estimated net worth of $1.2 million dollars she is currently ranked among the richest female musician in Nigeria. Niniola is a beautiful Nigerian female musician,she is a talented singer and songwriter,Nini's birth name is Niniola Apata,in 2013 she finished as the third runner-up on the sixth season of Project Fame West Africa,ever since she has been consistent in the Nigerian music industry. Some of her hit songs include ''Maradona'' ''Magun'' etc. Niniola has an estimated net worth of $1.1 million dollars. Omawumi's birth name is Omawumi Megbele,she is a Nigerian musician,song writer and an actress. She has written and produced some chart topping songs. Omawumi is currently estimated to have a net worth of $1million dollars. Simi is currently one of the richest and most influential female musician in Nigeria today,her songs receive massive airplay in Nigeria. Simi's birth name is Simisola Bolatito Ogunleye,she is a talented Nigerian singer and songwriter. Simi has one of the best voice in the Nigerian music industry,she was born in 1988 in Ojuelegba, Lagos. Some of her songs include "Joromi" ''I Dun Care'' etc. Simi has an estimated net worth of $900 thousand US dollars.